Ever wondered what makes a quality gemstone or diamond? Jewelry By Design has over 30 years of diamond and gemstone “know how”. This means we want to ensure that you have the best insight and confidence about your purchase as possible. 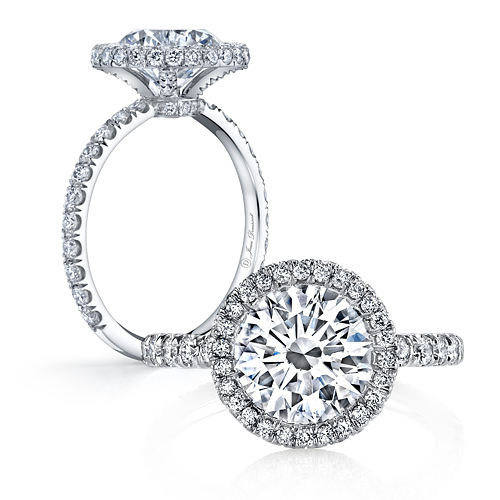 We know selecting the perfect diamond for you, or for her isn’t always an obvious decision. No worries! Let our diamond professionals do the explaining for you. Below, we briefly illustrate the 4C’s of Diamond Quality: cut, color, clarity, and carat weight. These are the four most important features of a diamond to consider and understand when making your lasting purchase. Our Master Jeweler, Mr. Mark, states that diamond cut is one of the most fundamental components to consider when buying. We often think of a diamond's cut as just the shape of the diamond like oval, pear, or round for instance. However, a diamond's cut grade is truly about how well a diamond's features interact with light. The cut is the biggest factor in creating shimmer, sparkle, and luminosity. Even a diamond of the highest quality in terms of color and clarity can still appear dull if the diamond cut grade is poor. After diamond cut, diamond color is the second most important factor to consider when buying. It’s true! The highest quality diamonds are colorless. Lower quality diamonds tend to have noticeable traces of a yellow-ish hue or color in them. At Jewelry By Design, we are accredited by the Gemological Institute of America (GIA) who grades diamond color on a scale of D (colorless) to Z (light yellow or brown). To maximize your budget, near colorless diamonds will always ensure the very best value. Diamonds are one of nature’s most beautiful creations. During this natural process, a diamond can develop a variety of internal characteristics called 'inclusions' or external characteristics called ‘blemishes’. Clarity of a diamond begins with an assessment of these two aspects. The Diamond Clarity Scale begins with ‘Flawless’ on the left side and the more you proceed to the right, the more ‘Included’ your ring becomes. Diamond carat weight is the most misunderstood of the 4C’s of diamond quality. Carat weight actually refers to how much a diamond weighs, not necessarily the size of the diamond. When contemplating carat sizes, you should also consider cut as well says our Master Jeweler, Mr. Mark. This is because a high carat diamond with a poor cut grade can actually make the diamond look and appear smaller. Use JBD’s expert buying tips to help you choose the best carat weight for you. The first thing that may come to mind when thinking of gemstones are gorgeous rubies, striking emeralds, and sapphires. At Jewelry By Design, we are proud to offer an exclusive collection of fine gemstones. The value and quality of precious gemstones is typically determined by their color, although the hue and tone is also equally as important to measure. We are certain our colored stones will exceed your expectations. At Jewelry By Design, we are proud to yell “War Eagle!” Not only is our showroom located on the beautiful plains of Auburn, Alabama, JBD is proud to let you know they are an official Auburn University Licensed Jeweler and have been for over 10 years! We love to create and design stunning Auburn-inspired fine jewelry. Whether you’re a recent graduate, still pursuing a degree, or just an Auburn fanatic like us, we are certain you will love our Orange and Blue collection!